Mark The Longest Tennis Match With Haiku : The Two-Way Wimbledon's official poet wants people to send him haiku marking the longest tennis match. 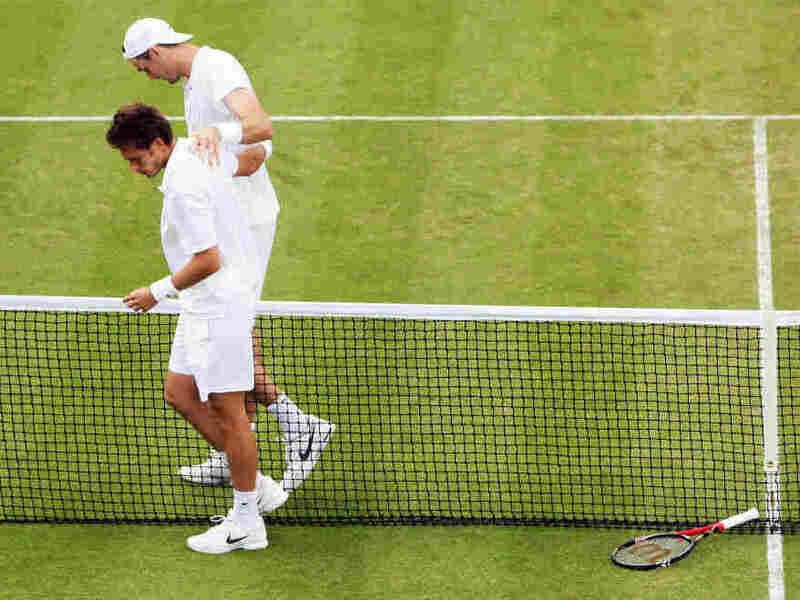 The longest professional tennis match ever -- the Wimbledon marathon between John Isner and Nicolas Mahut that finally ended Thursday after 11 hours and five minutes spread over three days -- should be celebrated with the shortest of poems? That conceit comes from the mind of Matt Harvey, Wimbledon's official poet laureate. Harvey shared the idea with All Things Considered co-host Robert Siegel Thursday. HARVEY: I want to put a call out for people to tweet to @wimbledonpoet. I want to make a collective effort of haiku. ROBERT: OK. (laughs) Then you must set a good example right now. All day and yet no climax. That's pretty good, actually. Small wonder he's the official poet for the prestigious tennis tournament. Harvey offers more explanation on his web site. So please send lines in about this epic match to my Twitter account @wimbledonpoet. Send haiku, one-liners, flowery couplets, anything that'll fit into 140 characters. I'll put them up on this blog tomorrow. Or soon. I promise. *a haiku is of Japanese origin, a short poem of three lines, each of five, seven, and five syllables respectively. I met a Japanese/English poet who told me not to get hung up about counting syllables. So I don't, and hope you won't either. So start sending Harvey your haiku.